REPAIR CLASSES NEXT WEEKEND NOV. 14 & 15th! First up, we have the BROMMIE CLINIC–our hands-on class where we teach you how to keep your Brompton folder bike happy. NEXT ONE IS THIS SATURDAY, Nov. 14th, 9 a.m. to 10:15 a.m. FREE, but you must reserve to hold a space in this small class. Email info@trophybikes.com with BROMMIE CLINIC in the subject line to save your spot. NOTE: After class, we’re headed right to the PHILLY TWEED RIDE at the Waterworks at 11 a.m.–so bring a tie and your best thrift store jacket! THE PARK TOOL SCHOOL is our most popular class–a full day intensive in which we cover everything involved in tuning up and maintaining a modern derailed bike. NEXT CLASS IS SUN., Nov. 15th, 11 a.m. to 5 p.m. Just $99 covers instructor fee, materials, the Park Big Blue Book of Bike Repair–AND a coupon good for 15% off any tool order. We provide all the tools, coffee and clean rags needed for this detailed class. Spaces limited–call now to enroll at 215.990.9275 during our open hours (8 am to 7 pm weekdays). Tagged Bicycle Repair Class, Brommie Clinic, Brompton Bicycle, Brompton folder, Brompton Repair, Home Mechanic skills, Park Tool School, Philadelphia Bicycling, Philadelphia Tweed Ride. 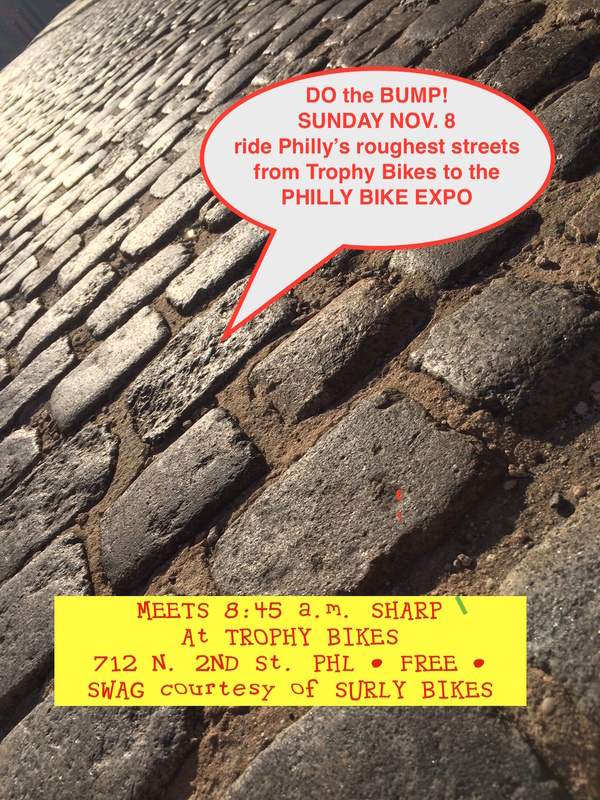 Trophy Bikes will be at the Philly Bike Expo Nov. 7-8, & you should be as well! We’ll be showing the latest from BROMPTON and SURLY. We’ll also have some fun rides. • Saturday, there is a Brompton Breakfast Roll to the Bike Expo. Meets 9 a.m. sharp inside Amtrak 30th St. Station (at the central info booth). We’ll ramble up and under Philadelphia’s lively center city before winding up at the Expo right around opening. NOTE: your Brompton bicycle gets you into the Expo free, including secure indoor bike parking. • Sunday morning, DO the BUMP! This challenging ride will tackle a choice selection of Philadelphia’s oldest cobbled, brick-paved, crumbling historic streets. We rumble over the roughest roads in Kensington and Old City before arriving at the Philly Bike Expo. There will be priceless Swag thanks to Surly Bikes. MEETS 8:45 sharp at Trophy Bikes, 712 N. 2nd St. NOTE: we strongly recommend min. tire size of 2″/38mm AND helmet, spare tubes, gloves and sense of humor. Please check in at our FB Events Page! SURLY SUNDAY AT THE EXPO If you’re riding your Surly bike on Sunday, your ticket is free. Head straight for the heavily-guarded indoor valet bike parking and show them your ticket for free admission. For all the latest Expo events, click HERE.